The number of endpoints a VM can have. The bandwidth an Azure website may provide. Total VMs a virtual network may host. This is where to find detailed Azure pricing information of Azure services with options like pay-as-you-go, Microsoft resellers, and enterprise agreements. A good reference this is. Keep it handy. This is a what-if analysis tool. How will the costs be different when changing your deployment plan from 3 small Linux VMs to 2 Large ones, deploying Oracle Weblogic server with A5 instead of A8, and replacing locally-redundant storage with geo-redundant storage? Just drag the slide bar on each category and one can realizing the combined baseline costs form the number shown under full calculator. There is also a VM calculator (http://aka.ms/AzureVMCalculator) to better understand the cost implementations on VM, bandwidth, support, etc. with Azure Infrastructure Services. Do examine the SLAs from a cloud vendor including those of Microsoft’s. Cloud computing is emerging and the business model continues evolving. SLAs are not all created equal. Pay attention to the fine print. Understand what does and what does not count as an outage and when there is one how a subscriber is compensated. Following your flow of data, the overall SLA is the service with the lowest SLA along the path. Support costs will have impact on the business values of an application throughout the lifecycle. Not just the support subscription costs, but also the associated activities to initiate, monitor, manage, and document support activities. For some industries, if it is not compliant, there is really no point of investigating the cost of a solution. If compliance is a requirement, investigate early. For Azure, this page lists out all the achieved certificates. Pay attention to those referenced links like Azure HIPAA Implementation Guidance. Some specifically document the implementations for a cloud applications to become compliant. Cloud is about the ability to deliver instant gratification, and grow or shrink the capacity based on demand. Those days of rolling out a patch in 6 weeks, deploying a branch office in 3 months, building a cluster in two weeks, are long gone. The delivery needs to be on demand, in the next hour, within a half-day, or something relatively quick. At the same time, cloud is not an one-size-fits-all platform. And there are legitimate reasons not to deploy resources in cloud. Get all the facts, learn how cloud works, and assess the risks. Know what you pay for, set a realistic expectation, then cloud responsibly and happily. So where to start? Learning by practicing is what I recommend. For those who do not subscribe MSDN which offers Azure monthly usage credit, sign up a 30-day free trial at http://aka.ms/Azure200 and follow http://aka.ms/Azure101Series and http://aka.ms/Azure102Series to start making cloud work for you. Use Azure as your datacenter, your global networks, and your colossal storage drive in cloud. This is a PDF file of my presentation at the event in Microsoft Malvern office on 09/23/2014. I had a great time meeting the folks and delivering the event. In part 5 of our “Modernizing Your Infrastructure with Hybrid Cloud” series, Keith Mayer and I got a chance to discuss and demonstrate ways to manage and automate a hybrid cloud environment. System Center, Microsoft Azure and Windows Azure Pack combined with PowerShell are great solutions for hybrid cloud scenarios. Keith is a great guy and we always have much fun working together. [1:15] When architecting a Hybrid Cloud infrastructure, what are some of the important considerations relating to management and automation? [4:09] You mentioned PowerShell for automation … how can PowerShell be leveraged for automation in a Hybrid Cloud? [7:54] Is PowerShell my ONLY choice? Are there other automation and configuration management solutions available for a Hybrid Cloud? To publish a gallery item in Windows Azure Pack (WAP), the associated OS image disks, i.e. vhd files, must be set according to what’s in the readme file of a gallery resource package. For those who are not familiar with the operations, this can be a frustrating learning experience before finally getting it right. This blog post is to address this concern by presenting a routine with a sample PowerShell script [download] to facilitate the process. 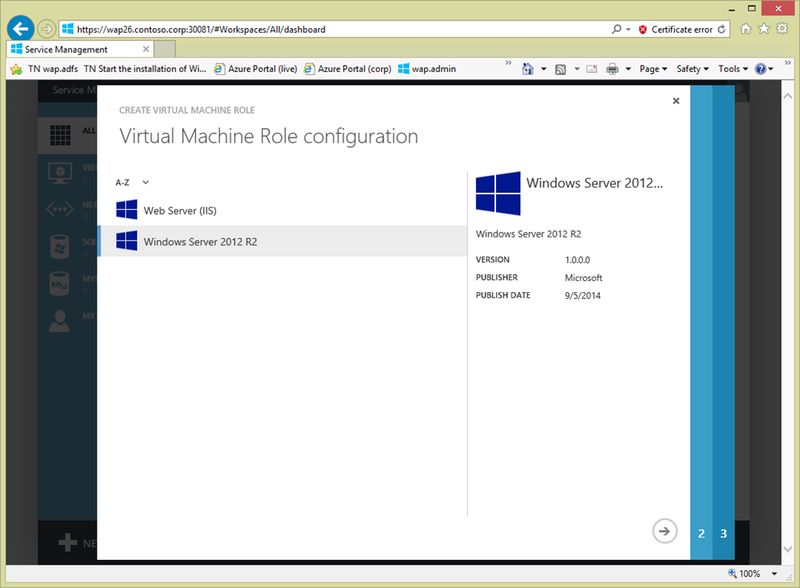 For example, below is from the readme file of the gallery resource package, Windows Server 2012 R2 VM Role. It lists out specific property values for WAP to recognize a vhd as an applicable OS image disk for the Role. To find out more about WAP gallery resources, the information is available at http://aka.ms/WAPGalleryResource. As a gallery item introduced into vmm and WAP, the item then becomes available when a tenant is provisioning a Role as shown below. Here, prepping vhds is the focus. And the process and operations are rather mechanical as detailed in the following. The script below illustrates a routine for a vmm administrator to set required property values on applicable OS image disks in a target vmm server’s library shares, . This sample script is available for download. Line 23 connects to a target vmm server. 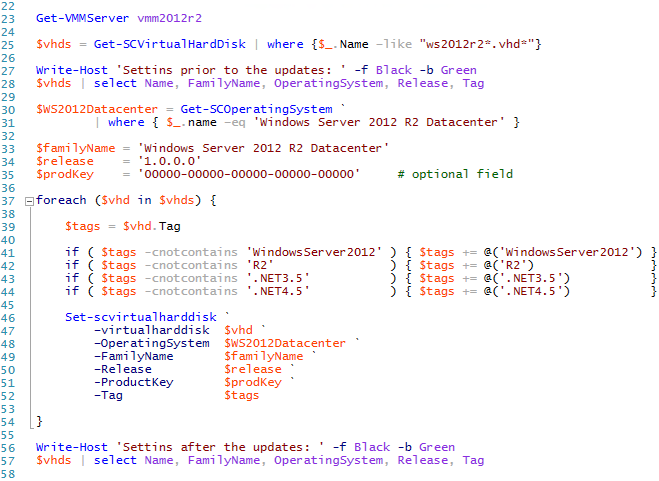 Line 25 builds a list of vhd objects the prefix, ws2012r2, in their names. Which suggests a vmm administrator to develop a meaningful naming scheme for referenced resources. Line 27 and 28 display settings of the vhd files before making changes. Line 30 to line 35 are to set the values to specific fields including OS, familyname and release according to the readme file of a particular gallery resource package, for example, WS2012_R2_WG_VMRole_Pkg. And as preferred, one can also default a product key to a vhd. The foreach loop goes through each vhd in the list and set the values. WAP references the tag values of a vhd file to realize if a vhd is applicable for various workloads. Make sure to add all tag values specified in the readme file, as demonstrated between line 41 and line 44 to build the list. Line 46 to line 52 sets all specified values to corresponding property fields of a currently referenced vhd file. Finally upon finishing the foreach loop, line 56 and line 57 present the updated settings of the processed vhd files for verification. And with a vmm admin console of the target server, go to Library workspace and right-click an updated vhd disk to verify the property values are correctly set, as shown below. At this time, with correctly populated property values and tags, the vhds are ready for this particular WAP gallery item, Windows Server 2012 R2 VM Role. 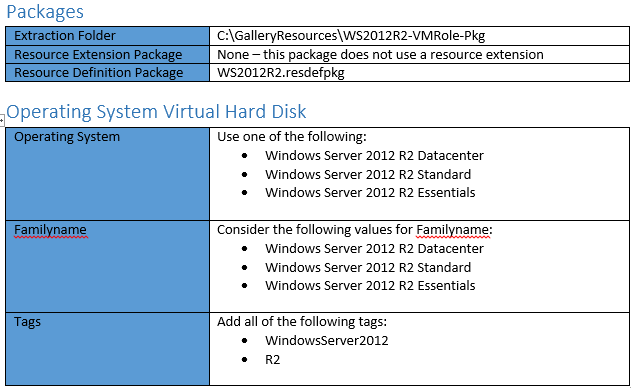 For all the gallery items which WAP displays, a vmm administrator must reference the readme file of each gallery resource package and carry out the above exercise to set property values of the applicable OS image disks. Pay attention to the tags. Missing a tag may invalidate an image disk for some workload and inadvertently prevent that workload from being available for a tenant to provision an associated VM Role in WAP, despite the OS is properly installed on the disk. The tasks of prepping OS imaging disks for WAP gallery items are simple and predictable. Each step is however critical for successfully publishing an associated gallery item in WAP. Like many mechanics, understand the routine, practice, and practice more. 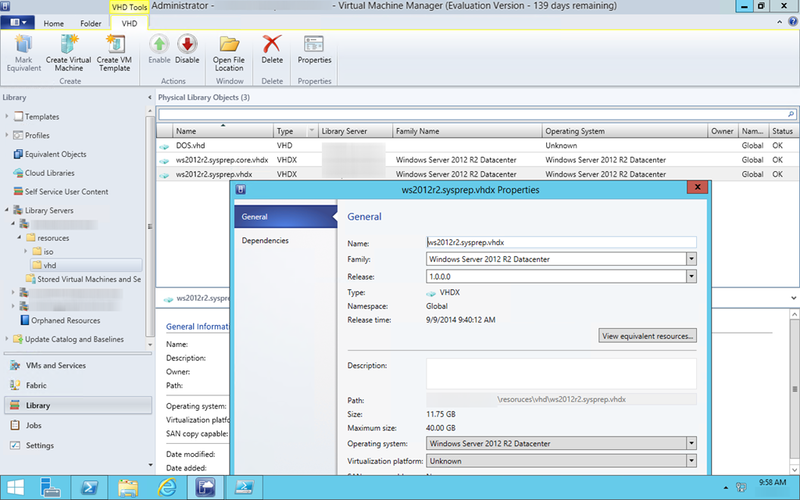 A vmm administrator needs to perform these operations with confidence and precision. The alternative is needless frustration and delay, while both are absolutely avoidable at this juncture of deploying WAP. 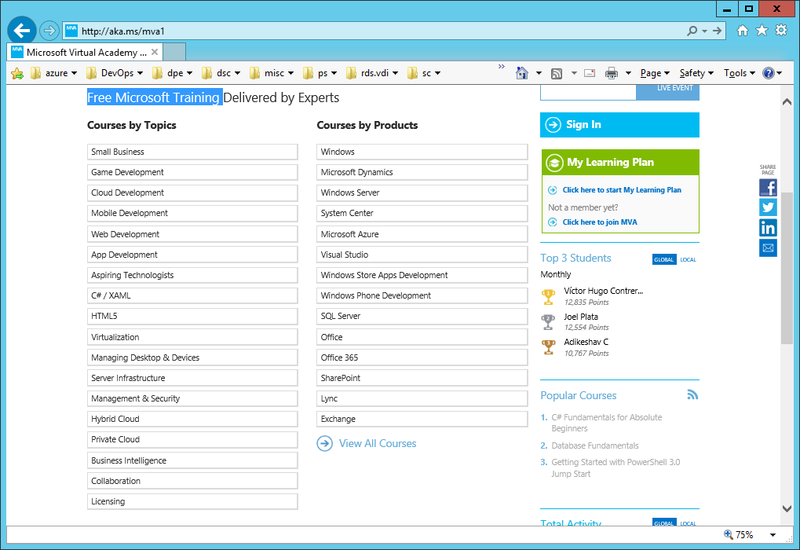 A knowledge portal with free self-training contents of Microsoft products and solutions is Microsoft Virtual Academy at http://aka.ms/MVA1. Developed courses as shown below are presented by topics and products for an individual to develop and customize a learning plan to best fit one’s interests and objectives. And the contents are packaged in modules with presentations, videos, whitepapers, etc. and they are available online as well as for download. Each module ends with a self-assessment to facilitate learning. There are also live events like Jump Start and Virtual IT Camps delivered by subject matter experts offering global IT community an accelerated learning experience on virtualization, hybrid cloud, Azure, Office 365, Application development and more. For an IT pros in any discipline and at any technical level, Microsoft virtual Academy offers an effective vehicle for developing IT skills profile and maintaining competency. And it is very easy to access the contents. Simply go to Microsoft Virtual Academy at http://aka.ms/MVA1. Pick and start a course of your interest and register/log in with your Microsoft Account which you can sign up one at http://outlook.com, if not already have one. Your Microsoft Account also comes with 15 GB OneDrive (i.e. cloud storage), Outlook-alike Internet email, and Office Web Applications all free. Once you have registered in Microsoft Virtual Academy, it is now up to you how fast and how far you would like to go from virtualization to Azure, hybrid cloud and DevOps. Do it. Learn it. Enjoy it. And be an IT pro. In part 7 of our “Accelerate DevOps with the Cloud” series on TechNet Radio, Keith Mayer and Yung Chou welcome Sr. Program Manager Michael Greene to the show as they discuss the importance of configuration management for organizations that are starting to leverage the cloud for their daily operations. Tune in as they also demo PowerShell DSC and how it can be used with Azure. [2:30] When an organization is beginning to leverage the cloud, why is Configuration Management important? [5:01] How is Configuration Management different from Automation? [6:48] Is Configuration Management more than just initial provisioning? [10:29] What tools and resources are available to perform Configuration Management? [13:03] How does PowerShell DSC differ from PowerShell scripts? [15:11] Is PowerShell DSC specific to only Windows workloads? [17:23] DEMO: Can you show us how PowerShell DSC can be leveraged with Azure? (Part 1) Accelerate DevOps with the Cloud – What is “DevOps” and Why is it Important for IT Pros? (Part 2) Accelerate DevOps with the Cloud – How Does Microsoft Azure and the Cloud align with DevOps? Continuing our “Accelerate DevOps with the Cloud” series on TechNet Radio, Yung Chou welcomes Sr. Program Manager Charles Joy to the show as they discuss the be the importance of automation in your datacenter especially when it comes to advancing your DevOps strategy. [2:36] How does automation help organizations accelerate the delivery of new solutions as they move to the Cloud? [5:18] What tools and resources are available to help IT Pros get started with automation? Do they need to be a professional “scripter”? [6:04] Do IT Pros need to learn a different set of tools for automating each component? [6:26] If an IT Pro is automating cloud resources in Azure, do they have to spin up an entire set of infrastructure components just to handle automation? How does Azure automation organize and leverage these automation sequences? [7:22] How can Runbooks be triggered? Based on schedule? Based on other events? [8:24] Is Azure Automation extensible? Can I incorporate other PowerShell modules?